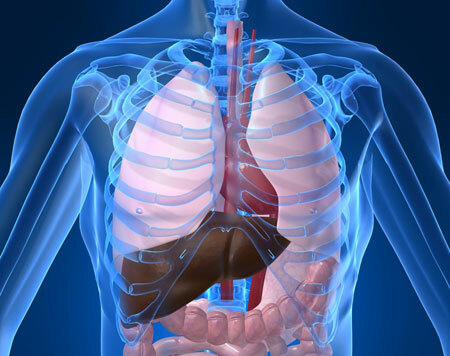 Located under the right arch of the rib cage, the liver silently performes it’s never ending tasks of detoxifying, metabolizing, decomposing, building and rebuilding. This metabolic organ, weighing about 1,5 kg (3,5 lb), is vitally important and we have no way of compensating for it’s functions medically. All the venous blood from our intestines pass through the liver, where it’s filtered from toxic compounds and the products from the digestion is repackaged for further delivery to the cells. The liver also produces and secrets bile, the green-yellow fluid that sometimes comes up when having a really bad stomach flu. The yellow color is from billirubin, a product of the decomposition of red blood cells, a process that takes place in the liver. The bile is important for the break down and uptake of lipids in the small intestine. It forms fat droplets with the digested fats, making the surface area for enzymatic digestion greater and speeds up the process. Without the bile, most of digested fat would pass through, as would the fat soluble vitamins, A, E, K and D.
Glycogenisis – the formation of glycogen for storage in liver and muscles (muscle cells can also do this). Gluconeogenesis – Building glucose/sugar from amino acids, lactate or glycerol. Glycolysis – the break down of glycogen to glucose. Fructolysis – the break down and metabolism of fructose into glucose or pyruvate. Building, decomposing, rebuilding and storing proteins. Synthezising cholesterol and packaging it with different transport proteins to deliver it to different cells. Producing coagulation (blood clotting) factors. Vitamin K1 is necessary for this process. Breaks down or modifies toxins and so they can safely be excreted in bile or urine, through a process called conjugation. It’s also responsible for the break down and inactivation of many medications and drugs – antibiotics, benzodiazepines (an anxiety reducing drug) and alcohol among others. Stores a multitude of substances, such as vitamins A, D, K1, B12, iron, and copper. Produces albumin, the main protein and osmolar component in the blood. It transports a lot of substances and keeps the fluid of the blood in the vessels. Storage unit for blood. A lot of blood is going through the liver, normally about 450 ml is located there. In times of need this can be expanded to more than the double amount. As you can see, the liver performs a multitude of functions, simultaneously, quietly. The only time you will realize you have a liver is when it’s not working properly, as in bile insufficiency, which can have many causes, or congestion of the bile flow (most often because of stones blocking the path). Long term alcohol abusers also get to know their liver intimately, since that’s usually the organ that starts giving symptoms after a long time of high alcohol metabolism. The over consumption of alcohol and the demands it puts on the liver will slow down other important processes and one of the first signs is when fatty acids starts to build up in the organ. A sign of the liver working over time, since it’s not sending them out properly. Something similar seems to be happening with high amounts of fructose in the diet, it’s over taxing the liver and can lead to fatty acid build up, a field of interest for a lot of research. Give some thoughts of gratitude to this multitasking, vitally important, red organ. Remember, you only have one and it’s hard to replace, so take care of it.